Online Catalogue | Audio | Amplifiers | JBL Amplifiers | JBL CSM32 - Professional Public Address Processor And Zone Mixer. JBL CSM32 - Affordable, Professional Public Address Processor And Zone Mixer. Digital Processor With Analogue-style Control. Quick And Simple Configuration Via Front & Rear Panel Controls. Three Stereo Line Inputs And One Mic Input. One Line Input For Priority Audio. 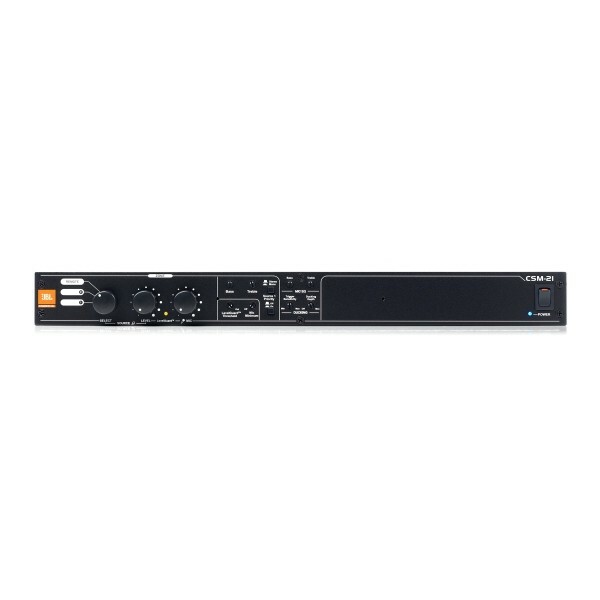 The JBL Commercial CSM-32 offers fixed I/O, pre-configured architecture, full stereo or mono operation, flexible routing and control of multiple audio sources, simple front-panel configuration and control without the need for a computer, compatibility with the CSR wall controllers, compatibility with the CSPM paging microphones, and optional duplication of audio channels to another device via a Cat5 cable. Dedicated controls for music EQ per zone and dedicated controls for global mic EQ allow the frequency content of each input type to be customised independently. In each output channel, LevelGuard is provided to retain consistent volumes between the various inputs, and AutoWarmth is provided to ensure full fidelity at all zone volume levels.